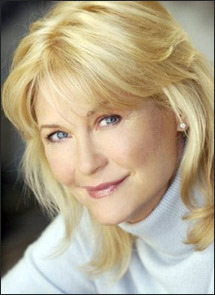 Dee Wallace has a calm, soothing quality in the frantic horror films in which she's appeared. It is an incongruous quality that served her well during her career...most especially as Mary the mom in her most famous film, E.T. The Extra-Terrestrial (1982). Wallace was born in Kansas City, Missouri on December 14, 1949. It was a low income household and both parents had to work. To make matters more difficult, Wallace's father was an alcoholic who was prone to verbal and physical abuse towards her mother. Growing up, Wallace studied dance and ballet. After teaching high school for a year and directing plays, she finally left Kansas City in 1975 and headed for New York. A successful auditon for Hal Prince led to parts in shows and commercials. After moving to Hollywood shortly after, Wallace found work in television...in the popular cop shows of the day, beginning with The Streets of San Francisco. Her first foray into the horror genre was as a maid in the chilling The Stepford Wives (1975). In fact, it was the very first time she appeared on the big screen. She had a much bigger role in Wes Craven's The Hills Have Eyes (1977). As Lynne Wood, she was the ill-fated mother in a family on their way to California...who soon are terrorized by a clan of cannibals in the desert. Her sad death (one of several in the Wood family), along with the kidnapping of her newborn baby...leads to the exciting climax in which her husband is instrumental in taking swift revenge against their tormentors. While waiting to find more choice film roles, Wallace continued to appear on various TV series. And then the hit movie 10 (1979) raised her visibility. The roles got bigger. In 1981's The Howling, she was quite good as a TV reporter who survives a werewolf attack. She ends up at a retreat that turns out to be not quite the safe haven she expected. Her on-air transformation at the end is quite moving...it's the best moment in the film. Her next major assignment would be Steven Spielberg's E.T. The Extra-Terrestrial (1982), a movie that would quickly surpass Star Wars to become the highest grossing movie of all time. It was a record that would hold for 15 years. Although not the center of a story involving a little boy and his friendship with an alien, Wallace was delightful. The claustrophobic adaptation of Stephen King's Cujo (1983) was a tour de force for Wallace. Spending much of the time stuck inside a Pinto while a rabid Saint Bernard tries to maul her and her son, she's protective and feisty. Her strong performance makes it one of the better works based on a King novel. Wallace continues to work nonstop. From 1986's Critters, to The Frighteners a decade later, to a role in the Made-for-TV film Perfect Husband: The Laci Peterson Story in 2004, she's an asset to any film in which she appears. These days, the actress also runs a full acting studio, in addition to having a second career as a motivational speaker. Asked what her value would be in motivating individuals, she responded, "I'm the girl next door who learned how to make life work the hard way. I lived it. Victim to victory. When you find the joy, you have to share it."